A stunning gents' timepiece with a beautiful and intricate two-tone bracelet. This watch really must be seen to be believed. Beautiful slim watch - delivered quickly and efficiently. I too went to Goldsmiths in Lincoln to have the bracelet altered which they did without charge - and even cleaned my rings FOC whilst I waited, What a great service. I am a big fan of Rotary watches and this watch is meets my expectations. The watch was ordered and received within 2 days. Excellent sevice I will definitely use Watchshop again. 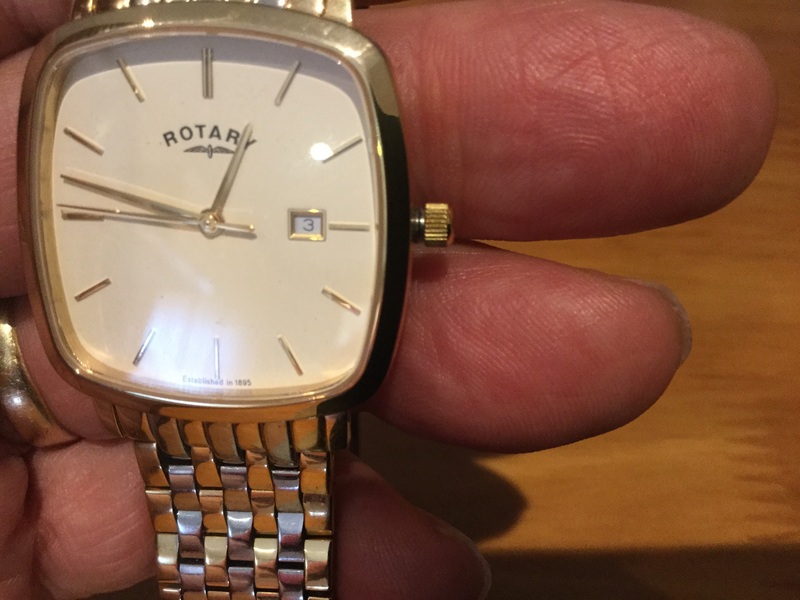 My old Rotary watch died after 25 years so I looked for one similar. 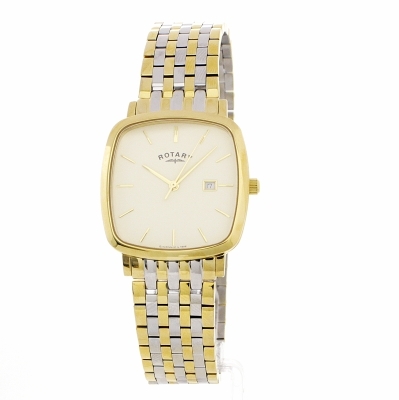 The nearest I could get was this Windsor Watch with two tone metal bracelet. The pictures do not do it justice even mine:-. It looks a million pounds on. The off white, almost pearly, face jumps out at you and is offset beautifully with the gold rim and two tone bracelet. The clasp is neat allowing the bracelet to seem to be just a single band round your wrist. I had to have the bracelet adjusted for my thin wrist but my local Bluewater branch of Goldsmiths did this very courteously with no charge. A lovely smart watch, very classic and is a great present. Suitable for all gold/ silver jewellery wearers as it is two tone. The watch is a beautifully slim and has an 'easy to read', almost square, champagne dial. The two tone bracelet feels good to wear and looks elegant. It's an excellent purchase for that special occasion ... and good walue for money, too, from the Watch Shop. I'd highly recommend it. I ordered this Rotary watch from Watch Shop one day and as promised it was delivered the next day. Excellent service and lovely watch. This is a present for my Husband. There was also no delivery charge, could not ask for better. This is a smart looking watch with a clear champayne face, second hand and date, complemented by a subtle two toned silver and gold bracelet. The features of some watch cases can look big and bulky but this watch is the very opposite - it is stylish, slimline and neat to wear on the wrist. It is a pleasure to wear and I am very pleased with my purchase.